I’m always a bit leery when playing something that has Compile Heart attached to it, especially after the train wreck that was Mugen Souls. That being said, Hyperdimension Neptunia Victory which released earlier in the year did give me some hope that with a little bit more polish, the developer/publisher is capable of releasing some decent games. 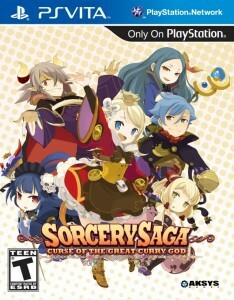 So it is with bated breath that I pick up Sorcery Saga: Curse of the Great Curry God in hopes that I may have another worthwhile game to add to my slim Vita collection. Turns out it’s one of my favorite games that they’ve developed thus far. 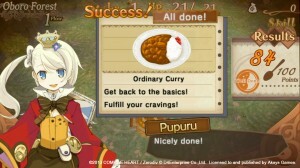 If the bizarre title didn’t already clue you in, Sorcery Saga is a cutesy tale revolving around the Great Curry God and a magical curry recipe. The main character, Pupuru, is a student at a magic academy who gets suspended after failing to complete a trial when representing the rest of the class. Well, she actually DID complete it, but a strange critter with the appetite of Kirby swallowed the item that she was to retrieve from there. When she returns home, she notices a new curry shop has moved in and is stealing all of the customer base from her favorite neighborhood restaurant. She decides that the best way to keep them in business is to seek out the ingredients detailed in the mysterious recipe she found in order to craft the perfect curry. 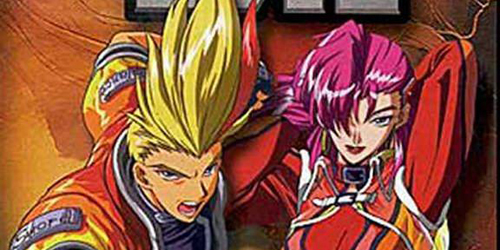 Matching the odd premise is an equally eclectic mix of characters: an evil demon who pines for and subsequently stalks the main protagonist, his jealous fiance, a young girl who can sense curry auras and talks with uncertainty (probably), three self-proclaimed heroes who constantly get caught in their own traps, and the list goes on and on. Much of the humor is situational and comes from the characters constantly misunderstanding each other, such as a dark wizard whose vague way of speaking is consistently interpreted as sexual innuendo. Little of it is laugh out loud funny, but it is a cute, feel good story as a whole. Speaking of cute, the presentation is full of disproportionate chibi-looking character designs, which is fitting given the subject matter. Cutscenes are presented as still portraits overlaid with dialogue, while the actual dungeons have squished 3D caricatures that maneuver around dungeons from an overhead perspective. 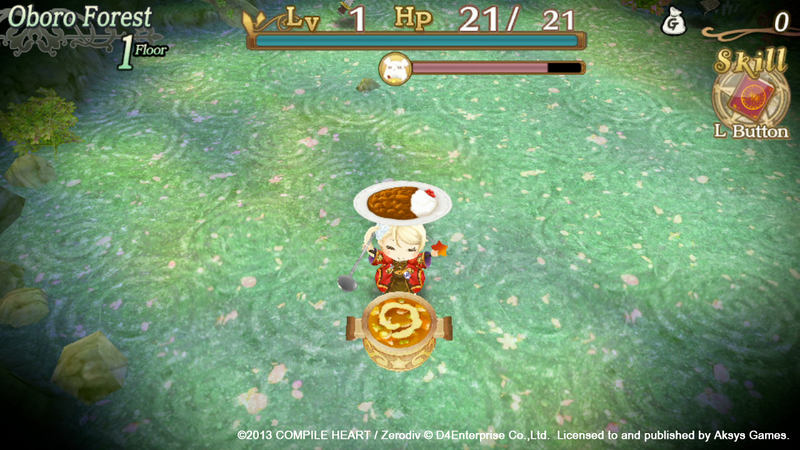 It certainly doesn’t push the capabilities of the Vita hardware, but the resolution looks really nice at least. Also, the monster designs are amusingly well done, with such enemies as a rapier-wielding eggplant and walking cobs of corn. The frame rate does have the tendency to chug a bit if there’s a ton of stuff going on at once, though I’ve only encountered it a few instances myself. All of the dialogue seems to be fully voice-acted, though there is only an option for the original Japanese track (sorry English dub fans). It sounded fine enough, though I noticed at times that it clashes with the vocal tracks that often play in the background. Since both are in Japanese, it makes the game sound way too busy and is quite distracting. The music is catchy at least, and you’ll learn to enjoy the various themes that pop up, particularly the boss music and the “oh crap, monster room” song. When you take Pupuru into a dungeon, the little puff ball that eats all, Kuu, follows along with you. 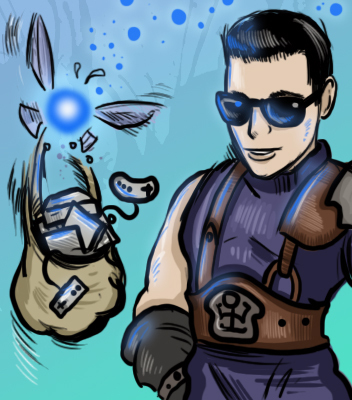 You don’t have any direct control over what Kuu does, but if you talk to him you can make use of unlocked skills earned from leveling up, plus he aids in fending off enemies. The forestry areas leading to each dungeon are all structured a certain way, but once you get inside, they are all randomly generated. Similar to other roguelikes, each step you take is a turn for both you and the monsters on the floor (you move, they move). The objective is to make it to the stairs leading to the next floor, though going straight for the stairs comes with risks. Do you stay on the current floor and loot all the treasure even if you may not have room for it all? 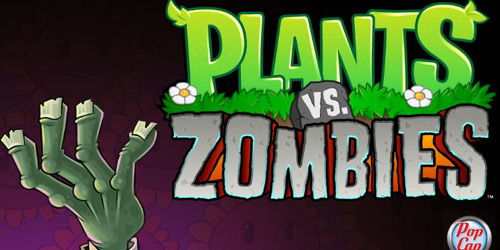 Do you kill all the monsters to level up? Do you head back to town with gear and money in tow and live to fight another day? All are decisions that have to be made the closer you get to the end of each dungeon. Meeting your demise will send you back with nothing other than the equipped weapon and shield you had when you went in. That means, all money is lost, items are dropped, and your level is reset to level one. 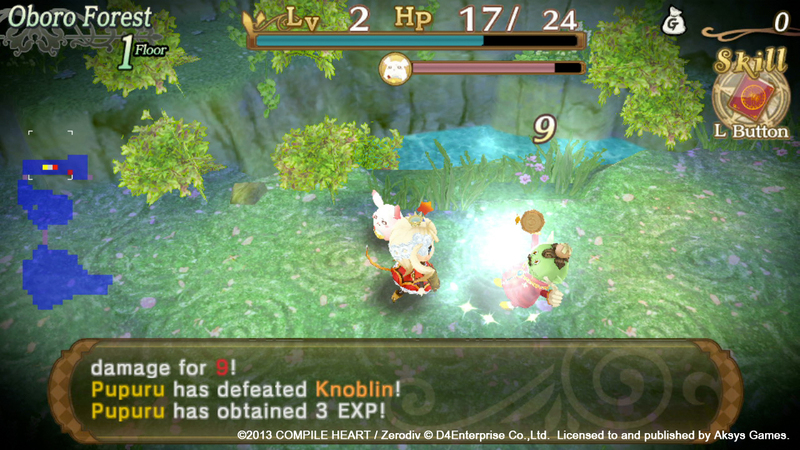 Despite that, the game is incredibly easy for a roguelike, perhaps more so than The Guided Fate Paradox. Grinding isn’t particularly necessary and most of the dungeons I was able to clear on the first attempt. This is a shame if you’re looking to be punished, especially since there didn’t appear to be any selectable difficulty settings, but it’s great if you’re new to the genre. Controls are pretty easy to master too, since there isn’t much to learn and you don’t need to use the touchscreen or touchpads for anything. 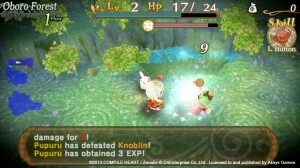 You can strike enemies with an equipped weapon with X, subsequently using a turn each time you do, or cast spells with L. There are a number of long corridors that you will find yourself exploring which can be traversed easily by dashing with the circle button, though you won’t be able to stop unless you hit something or reach or a corner. Short of looking around or accessing the menu, that’s about all you need to know. There’s a number of traps that you’ll need to be aware of as you explore, such as rooms that spawn a ton of monsters, or treasure chests that send you back a floor. 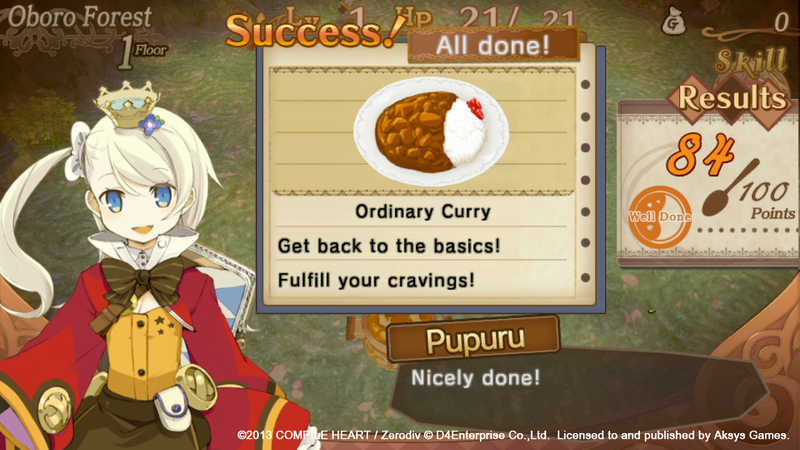 Collecting the right combination of food items will let you mix curry on the spot, with consumption leading to stat and experience bonuses for Pupuru. Kuu needs to be fed from time to time as well, which can be a pain to manage, especially since his hunger is affected by how much damage he takes and the wrong food item can make it worse. Letting it run low will cause him to whine, sending all of the monsters on the current floor in your general direction. You can’t leave him behind either, so it’s in your best interest to keep him fed always. 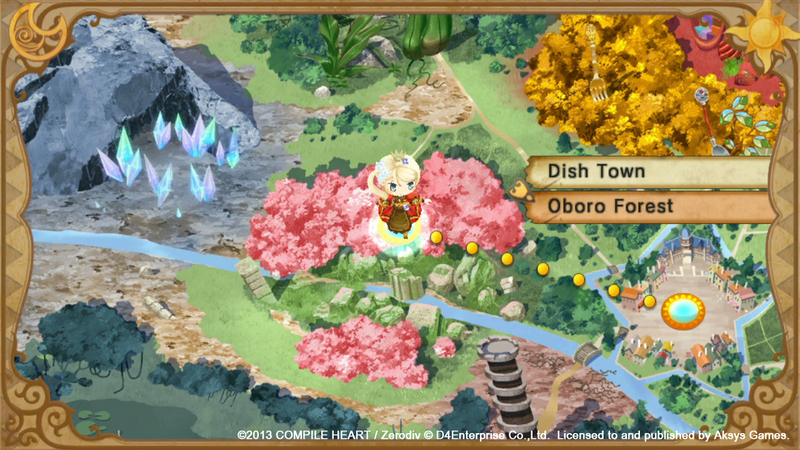 The town acts as a sort of hub of sorts where you can perform a number of tasks before going into dungeons. Pupuru’s room will let you bank items and money, equip skills and spells, or change clothing. You’ll eventually unlock the capabilities to fuse items together in order to combine their properties, a feature that makes it incredibly easy to overpower Pupuru. A stop down at Smile Curry will let you buy and sell items as well as learn new recipes for curry. The Magic Academy keeps track of various requests, which usually involve defeating a particular enemy or clearing a dungeon so many times. Success will grant new clothing items to wear though, so completionists will certainly have reason to do so. Finally, the library keeps track of your stats and compendiums, plus obtaining particular items will unlock events that can be viewed at the theater here. These Chara Theater events are very similar to the skits in Tales games, in that they aren’t necessarily relevant to the overall plot, but exist as a way to see the game’s characters interact with each other such that players may find it amusing. Despite the lack of challenge, I found the dungeons to be a bit too long. It does offer you a number of floors where you can teleport back to town with everything intact, though the downside to doing this is you have to start back at the bottom each time. I think I would have preferred a little more pushback as a tradeoff for having checkpoints within the dungeons. The Guided Fate Paradox had this, and although I enjoyed Sorcery Saga more than that game, it’d been a nice feature to take away from that. At least you can use temporary saves that delete themselves when you launch the game if you ever have to put it down for any reason. I should also mention that the core game is quite short for a roguelike as well, with five chapters clocking me under 20 hours. There are some optional areas to explore, plus some epilogue content to enjoy when you’re done. I honestly prefer the shorter experience (speaking as a twenty something with a full time job), but it at least bears mentioning on account of how lengthy these games normally tend to be. 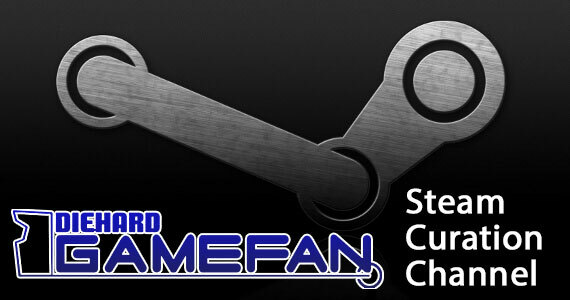 There’s a fair amount of DLC available, such as costumes and voice over packs, though I was alarmed to discover that the game requires that you be connected to the internet to use any of it. I expected as much from Compile Heart, a company who dumps characters in your party that you can’t use unless you pay up (a la Hyperdimension Neptunia). But always online DLC from a portable console that the player may not even have the 3G version of? 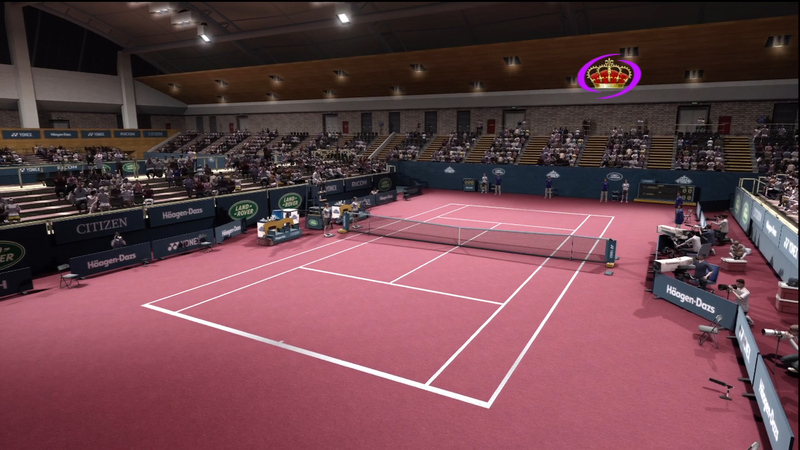 That’s a bit ridiculous, even for some of the free DLC. If you don’t have any downloaded, the game will instead shut off your wi-fi so you don’t see when your friends are logging in and out. 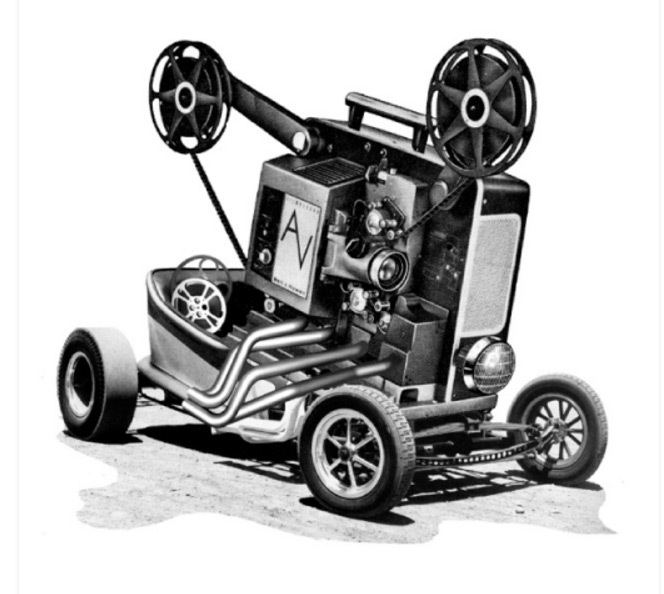 For a title that has no online functionality to speak of, the way it handles internet is nothing short of bizarre. Despite its quirks, Sorcery Saga: Curse of the Great Curry God is a cute little romp through randomly generated dungeons that was a pleasure to play and a great entry point for roguelike newcomers. Its odd sense of humor didn’t amuse me quite to the level that the Hyperdimension Neptunia games did, but it did crack a few smiles and kept me playing far longer than The Guided Fate Paradox managed to. If you’ve always wanted to step into the genre but never had the time nor patience to get your feet wet with others of its ilk, pick this one up. 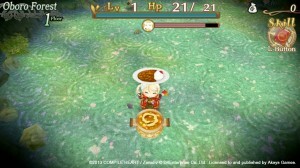 Sorcery Saga: Curse of the Great Curry God combines a cute and sometimes humorous tale about mythical curry along with some simple, easygoing roguelike action. The lack of challenge will put off veterans who are more used to some of the more unforgiving aspects of the genre, but for newbies, it’s a fantastic place to start. While it doesn’t showcase the capabilities of the Vita by any means, the chibi aesthetic lends itself well to the experience. Adjustable difficulty levels and more checkpoints in dungeons would have been nice, as would less draconian DLC loopholes, but the game still stands as one of the better titles Compile Heart has had released in North America. This was a well-written review. Thanks for the insight. I’m really excited to play this game!